tpdnews: New Beford man arrested for Indecently Assaulting female . New Beford man arrested for Indecently Assaulting female . 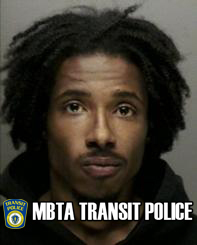 On December 17, 2015 at approximately 1:30pm Transit Police officers received a radio call to respond to the MBTA's Downtown Crossing station for an unknown disturbance on the southbound platform of the Orange Line. Upon arrival officers had their attention drawn to a male, later identified as Terrell Alves, 25, of New Bedford who was in a agitated state and yelling at several passengers. Officers were then approached by a female victim who informed them Alves had indecently assaulted her while travelling on the train. Other passengers who witnessed the assault came to the victim's aid which resulted in Alves engaging in a verbal confrontation with them. Officers placed Alves into custody for Indecent Assault & Battery and transported him to Transit Police HQ for the arrest booking process. During this process it was discovered there was a warrant in existence for Alves' arrest issued out of Wareham District Court for 2 counts of Vandalize Property. Smoking leads to another warrant arrest. Cambridge man arrested for Open & Gross Lewdness.